come one come all to the greatist (Fan Artist) show of them all. Artist come and share your techniques, your masterpieces, and your humorus pictures. So lets all have fun and see that art! hey i need some advice im planing on making out of scultpy (modeling clay) a yoshi yoshi. 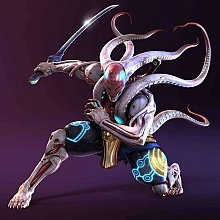 make yoshi from mario look like yoshimitsu. im not quite sure on the pose nor or what to make look like yoshimitsu on yoshi. im thinking that i would make him have the old manji look the sharp teeth, dark eyes, red mohawk, but on his body i need some help on the details i chould out in. Nice pics I have seen in your galleries. Ever thought about making wallpapers? BTW if you want your gallery to be seen by guests as well, change the level to "0" in "who can view the gallery". Hey Tenshi, I just wanted to know if i could take one of your old Pictures and do a mix of it. If you don't mind either me or jon (he is better at it) will take one of your fanarts and mix it, kinda like a New Birth for your fanart. But that is if you don't mind of course. No problem. I don't mind it. But don't put a copyright to it, OK? No worries, your work is your work. i just want to make it extream but jon can assist me in that. he knows what he is doing. jon i put the pic in my gallery fix it and delete the one in my gallery. You have your orders soldier, NOW MARCH!!!! Some damn fine editing on those pics! Tenshi's new fan-art is also pretty good. Looks like you got rid of the sword and the "shopping bag". LOL! Sure thing, hehe. I don't paint things I don't like. Great job with mixing. You expressed a feeling of these pics extremely well. Well we are good at what we do But like i said earlier Jon is amazing. so glad to hear you like them and thanks for the accolades. well back to the bat kave Ruben (he he Jon Thats Funny). ok bat man. URRRRRRRR! Ciete donkey Urr. anyway im glad u all like the pics. kevin's arre preety cool to. i have taught him well. the force is strong within him. sorry for the whole star wars quote. eventually i will have so of my hand drawn sketch but for now the sic pics will have to do.